Hoooo boy, so many limes. We planted a lime tree in our garden about 4 years ago and haven't stopped drinking margaritas ever since. These Montreal Bagels are fresh out of my oven. They are for a guest post for Abbie from Needs Salt and one is soon to be sliced and slathered with butter and stuffed into my pie-hole. (Check out my guest post and get the recipe here). My baby copper pot. It was a birthday gift from my husband a couple of years ago. He knows that where most women want diamonds, I want kitchen stuff. I use it to melt butter/chocolate... but mostly I just gaze at it lovingly. 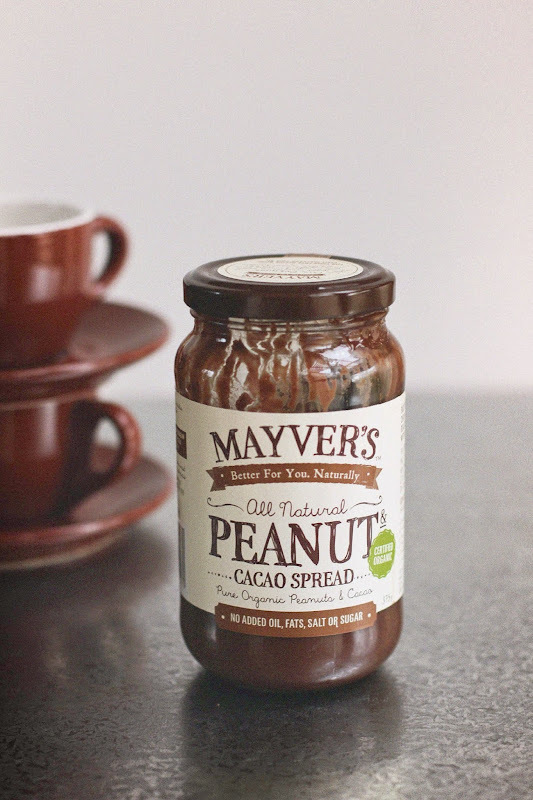 Mayver's Peanut Cacao Spread. I have been going on and on and on about this stuff here, here and here. It's my new favourite thing! ... (to dip pretzels into straight from the jar when I come home from the gym). What? Who said that? Pop on over and check out the links to bloggers’ kitchens around the world at In My Kitchen. Lovely. That certainly is a fine copper pot. And I love your bagel with all the seeds. So rustic and wholesome. Thank you. That little copper pot is a treasure. 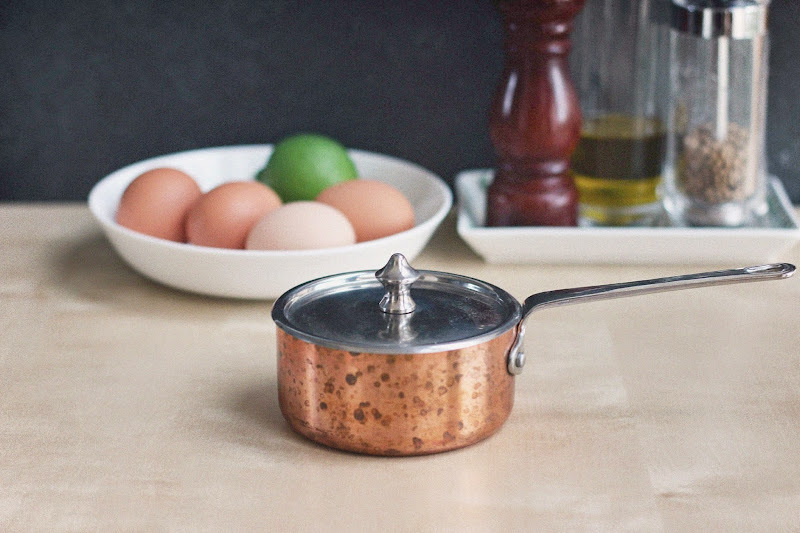 I love that little copper pot, and can you get your husband to train Chris please? Yay for limes. You need to drop lots of unsubtle hints to Chris. That's how I trained Clint. Nice one! All my lemons, limes and Kaffir limes are about to ripen! Don't you just love citrus? A lime tree! Ohh my god! It's so cool! Thanks Andréanne. A lime tree is a must around here. We're so lucky with our limes Johanna. There's a shortage in the US. Sorry to hear that your daughter is allergic to nuts. I totally understand how you would feel. Can I please move in? Seriously, pretty please? LOVE your little copper pot. My beloved always gives me cookbooks now :) and my limes are featuring heavily in G&Ts. But only because I need to buy some tequila. So envious that you have a lime tree. I keep reading about limes in IMK posts but unless we get some serious climate change, will never be able to grow them here in England! I couldn't live without my citrus trees. I have lime, lemon and blood orange trees. Not only do they provide us with the most fabulous fruit, they flower just about all the time so they look and smell pretty too. G'day! Love the sound of your spread and your bagels photo is AMAZING!!! Thanks for stopping by Joanne. The bagels will be featured on a guest post soon. I'll be providing a link so that you can see more photos of them and get the recipe. Can you please send me some limes? Pleeeease! Seriously, how awesome is it to have a lime tree in your garden! Thank you so much Sini. I would send you some limes if I could, but I don't think quarantine laws would allow it. Have a wonderful May. Thanks so much Celia. Yes, Montreal Bagels have egg in the dough and are slightly sweeter than other bagels. They are so, so good. Stay tuned as they are going to be featured on a guest post soon and I will be providing a link so that you can get the recipe and see more photos. Jennifer, love your cute pot. I wish I had some limes, lucky you. Lovely pot, my mom gave me her old copper pots and I absolutely enjoy them. Lucky you a lime tree. Happy week-end! Thanks Cheri. I love copper. It's such a great material for cooking in. Have a lovely weekend. It is margarita season isn't it? With Cinco de Mayo in a couple days! I just made some the other day with homemade lemon~lime sorbet. They were amazing! They would have been even more amazing if the limes had come off my own tree! Wish we had one!! Beautiful copper pot! What a good husband to give you something so beautiful! Yes! to that Mayver's Spread. I got some as a gift with sesame seeds in it. Delicious on ice cream with some halva crumbled in. 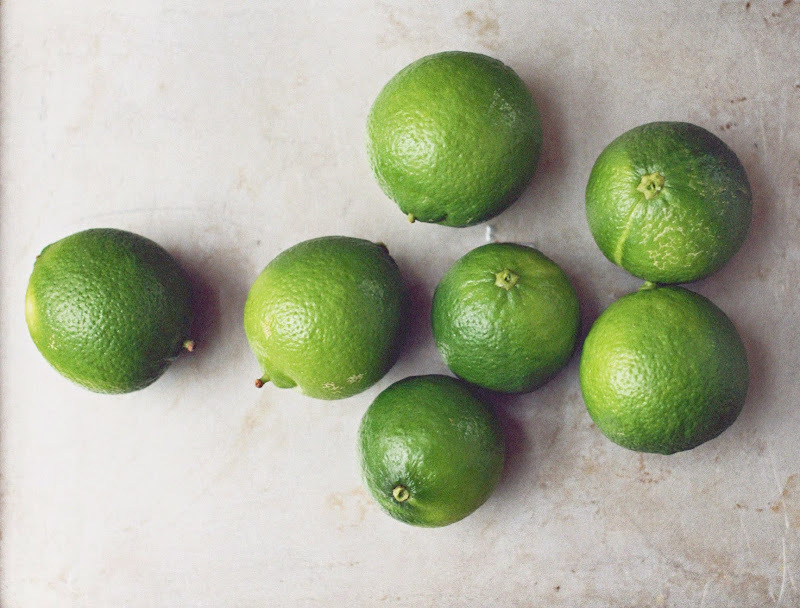 As to the limes - a common theme in this month's IMK. I wish you lived near me! Cheers and thanks for the tour. Thanks for stopping by Fiona. Mayver's spreads are so good. Your ice cream creation sounds delicious. I'm living on the stuff spread on rye bread with a mashed banana on top. I hear ya Lea Ann. Looks like our kitchens have a lot in common :) I am drowning in limes too and I have the same copper pot. It is lovely isn't it. Hey Tania, thanks for dropping by. I love my copper pot... and my limes. Aren't we lucky? 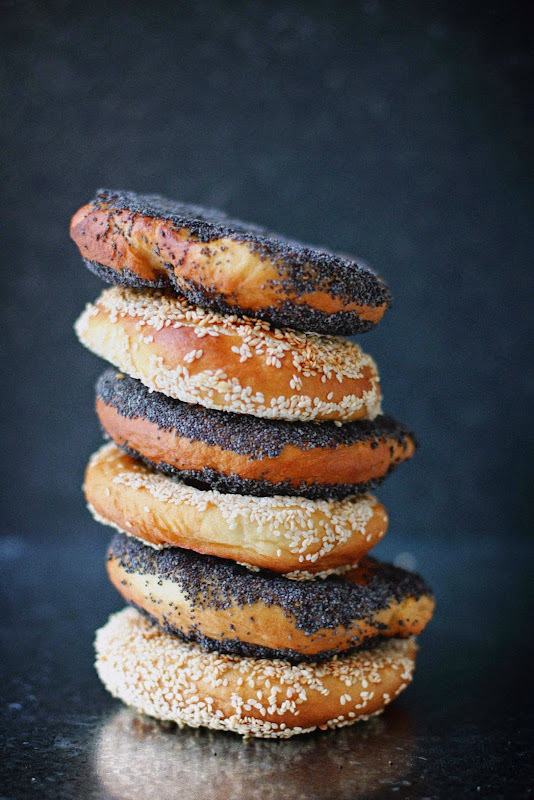 Divine looking bagels- leaping right off the page! Thanks Francesca. Bagel recipe coming soon. Stay tuned. I'm envious of your lime tree and all those margaritas! I also have great copper pot envy. I have one large copper bowl that I look at lovingly but that's it. Thank you. Bagels recipe with be coming soon. I want a lime tree. Love your chocolate peanut spread, perfect. Thank you. A lime tree is an essential here. I just found peanut coconut spread, squeal! Thanks so much Kim. They are fun posts to do.